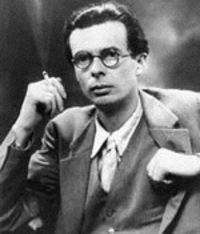 Aldous Huxley was author of the science fiction classic Brave New World. Do you remember what you were doing the day he died? I certainly do. I clearly recall many details of that day. I remember eating lunch that day at Gene's, a little drive-in hamburger place on Walton Way in Augusta. I even remember what I ordered. I remember the car I was driving as I sat there eating my two small cheeseburgers. And I even recall exactly what I was listening to on the car radio. I remember driving back over to the small radio station where I worked, and I can tell you exactly how I spent the rest of the day. If you're around 50 or older, you absolutely remember the day Aldous Huxley died. But, like me, you probably weren't even aware that anything had happened to him. Huxley died on this date in 1963.... the same day another well known person died in Dallas, Texas. I doubt Huxley's death was even reported on the news that day. That's the thing about dying on the day of a really big news event. It doesn't get much attention. Huxley was a prolific novelist, critic, essayist and poet. In the forward to Brave New World, Huxley says the book is about "the advancement of science as it affects human individuals." But many people considered it a warning. The story was set far into the future, in a world where people were produced in factories.... where there were unimaginable advances in science and technology.... where our present day concepts of freedom and morality would be severely challenged. It revealed a civilization that had conquered war, disease, pain, suffering, even grief and envy...... and yet, in the process, had lost the human spirit. But remember, it's about the world five or six centuries in the future...... right now, we have our own realities to debate and worry over. Things like: the pros and cons of human cloning.... pre-conception gender selection.... man-made spare organs..... drugs that keep kids calm and focused..... drugs that keep old folks potent.... and, of course, drugs that keep us all tranquil and content. Brave New World is science fiction. By the way, do you remember what you were doing the day author C.S. Lewis died? I do. Look it up.